From St Lucia we moved to Le Marin in Martinique to pay a visit to Inboard Diesel, who are the only people in the Caribbean I have found that really understand Volvo engines. They came over to inspect the Helm Information Unit, only to inform me that the new model may not work with my engine, but they will check with Volvo for a software update. Fortunately Volvo supplied the update and we now have working instruments on both engines. We also picked up 100m of shiny new anchor chain. Our old chain (which we already had re-galvanized in Florida) had reached the point where it was depositing rust in the windlass so my chain depth counter was not working. It still does not work reliably - I think the windlass will have to be stripped for cleaning. In Le Marin we met up with Edi and Blair from Honahlee (formerly Kind of Magic) and heard the full story of how Kind of Magic sank, which does require an evening and a few beers for the telling. We were lucky that we did meet up because they helped us install the new chain. A barrel filled with 100m of 12mm anchor chain weighs about a third of a ton, so you can’t lift it. What you can do is snake it around a bit at a time, which involves lifting 3 kilos 100 times rather than the full 300 kilos at once. So we took the dinghy over to the chandlery and snaked the chain in. We had berthed Anastasia bows first (which meant we had to use the dinghy to get on and off), but we could dump the anchor and old chain straight onto the dock. It sounded like just a question of pressing the “down” button on the windlass,but in a Catana catamaran the chain loops down from the windlass to a pair of pulleys under the beam at the front and the chain will not run out without the weight of an anchor on the end. This meant that a person (thank you Blair, that would have been me if you weren’t in our chain gang) had to stand at the front and pull all the chain over the pulleys. After that we just parked the dinghy under the bows and hauled up the new chain using the windlass, fixing on the anchor when we came to the end. It wasn’t a complex operation, but I underestimated how laborious it would be. It would have been a challenge (impossible!) for me and Andrea alone. 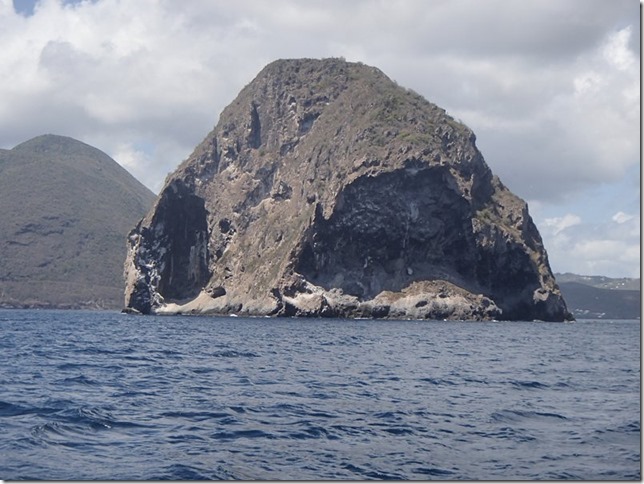 From Le Marin we drifted downwind to anchor at Anse D’Arlet overnight, passing HMS Diamond Rock as we went. 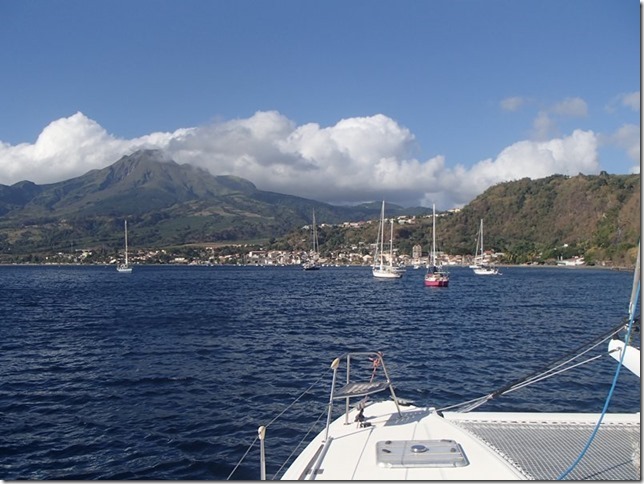 And then we sailed up the coast to St Pierre in the north-eastern corner of Martinique. 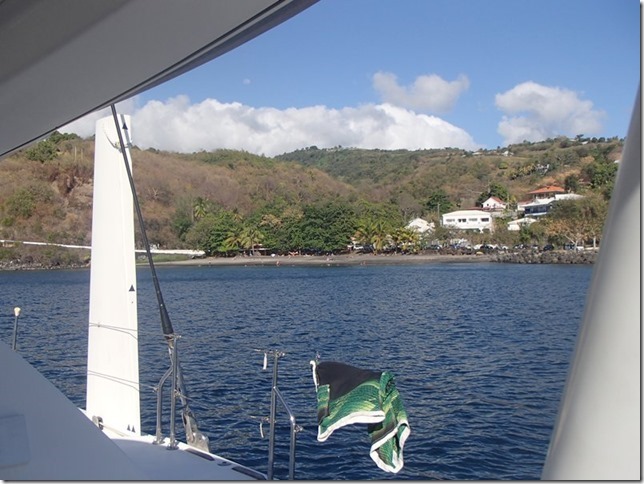 In the past we have anchored close to the town, but this time we anchored a mile south, off a picturesque little beach. Nice breezes and as calm as St Pierre. St Pierre with the volcano that destroyed the old town in the background. The anchorage to the south. 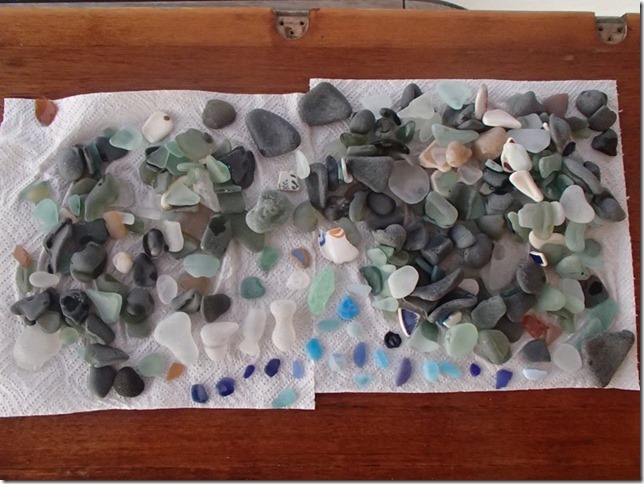 Of course, with the beach at St Pierre being the best sea glass beach of the Caribbean, I had to drop Andrea off a couple of times for beachcombing.